Techie Turtle’s been a little slow to learn about streaming, but as in other things, his motto is better late than never. If you’re already a streaming pro, skip this post and feel superior! If not, come alongside and learn to stream with Techie Turtle. If you like to hear the same music all the time, and you already own all the music you ever plan to listen to, don’t bother with streaming. You can put your beloved CDs and iTunes purchases into perpetual rotation. But if you’re like Techie Turtle and want to replay that new song you heard in spin class, you need a way to do it. Plus you’ll like the portability of streaming. You won’t need to tote around your music collection on a phone or external hard drive. Or be limited to the same six CDs you’ve had in your car forever. You also can live in the moment, act on impulse. One of the things my husband likes about streaming is that he can call up corny or annoying songs that relate to a comment someone just made. You never know. Napster and other music sharing services got people used to downloading music on demand. But they ran into copyright infringement issues. iTunes solved that problem, giving people the chance to buy a single song or a whole album. Yet you couldn’t play more than a few bars of an iTunes song without buying it. With most streaming services, you pay a monthly fee and can play all the music you want, on demand. This means you can choose the exact song you want to play. And play it right now, as many times as you want. Free streaming is usually supported by ads that interrupt your enjoyment of the music, much like radio ads. So last century! If only to cut out the ads, many people choose at least one streaming service they’re willing to pay for. Streaming services help you discover new music you might like. Their algorithms notice what you play and suggest songs from new artists that might be similar. They also offer playlists to help you stay up-to-date with current hits as well as emerging music. Spotify in particular touts its music discovery options. They offer company-curated playlists of top US hits, global hits, and so on. They also suggest new songs you might like with playlists “made especially for you.” These playlists, named things like Discover Weekly or Release Radar, vary from person to person based on listening history. Which are the most popular streaming services? By mid-2018, streaming accounted for 75% of US music consumption. 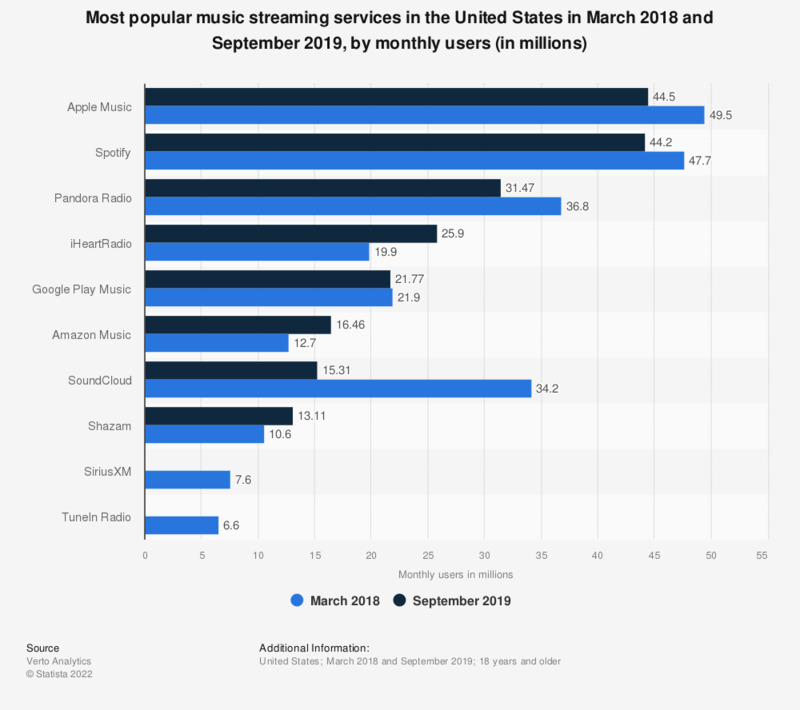 The chart above from Statista shows major streaming services as measured by number of monthly US users. Pandora Internet Radio started in 2000. Its first paid service, Pandora One, let you cut out the ads but still not choose specific songs to play. Spotify started in 2008. They gained market share quickly because their premium service eliminated ads and allowed you to stream on demand. Pandora Premium soon followed. But Spotify’s music catalog was arguably the largest in the industry. Apple Music came out in June 2015 and rapidly rose to dominate the US market. It boasts a catalog of over 50 million songs, which gives it an edge over Spotify. Although Apple Music is the most popular US streaming service, more people worldwide use Spotify. Which streaming service should you choose? While some of the less-popular services may appeal to you, Techie Turtle has evaluated only the top three: Pandora, Spotify and Apple Music. Pandora and Spotify have free streaming tiers. Apple Music doesn’t. For Pandora, the free tier includes ads, lets you play only in “shuffle mode,” and limits you to six skipped songs per hour. This is their radio station service, where you can thumbs up and thumbs down songs to curate a list that appeals to you. With Spotify, you get more in the free tier. It includes ads but also allows you to play songs on demand via desktop and web apps. Their mobile apps have limitations for on-demand song play. All three services offer substantially the same premium services. They give you on-demand streaming, unlimited streaming for the same monthly fee, and higher quality audio than the free tier. Apple’s Music library is the largest. Another Apple convenience is that it allows you to play any songs you’ve purchased on iTunes or ripped from CDs – all with the same interface. Spotify also has a large music library, with over 35 million songs. Following Pandora’s acquisition of Rdio in 2015, it also grew its music catalog to be almost as large as Spotify’s. The website Digital Trends offers reviews and comparisons of streaming services. It updates its content regularly. There are plenty of online resources for written as well as video reviews for all streaming platforms that interest you. Pandora and Spotify offer free tiers that are ad-supported. And in Pandora’s case, that allow you to play songs only in radio fashion, not on demand. Apple Music doesn’t offer a free tier. However, Apple gives you a longer free trial period than the other two: 90 days to try out their service. As with its competitors, you provide payment information up front. But you can cancel at any time prior to the end of the first 90 days and not get charged. Pandora’s free trial is 60 days, and Spotify’s is only 30. Presently, however, Spotify’s trial period offers a bonus: free ad-supported Hulu streaming. If you decide to become a premium subscriber after the trial period, you’ll pay the same for any of these services. All three cost $9.99/month for an individual plan and $14.99/month for a family plan that accommodates separate accounts for up to 5 (Spotify) or 6 (Pandora and Apple) users. Pandora also offers an intermediate tier for $4.99/month. This gives you unlimited radio listening without ads, but you still can’t choose to hear specific songs. Spotify and Apple Music offer discounted rates to students. Your kids have probably already tried Spotify and/or Apple Music. That doesn’t imply, however, that these services are only for millennials! You’ll find music you like to stream, no problem. Maybe it’s because he likes the fact that Spotify’s logo is green like him. Or maybe Techie Turtle thinks Spotify has a “cool factor” that Pandora doesn’t. And as for me, I don’t want everything in my tech life to revolve around Apple. The Spotify interface is easy to use, and my kids will occasionally share songs with me using Spotify’s social sharing features. So although options among the top three services are comparable, the Turtle is all in on Spotify. If your household has 2+ people, it makes sense to get a family plan for $15/month instead of $10/month. Streaming is an individual kind of thing. For example, if your spouse is listening to Spotify in his car and you try to play it in your car, you’ll get an error message that the account is already in use. Thus you’ll listen to silence, even if you’re the one who pays the Spotify bill. I know this from personal experience. Plus, as I learned before upgrading to the family plan, my husband has a habit of saving almost every song he listens to. And guess what: I don’t like all of them. I’m happy for him to have his own account and not clutter mine with his music. In fact, we use three accounts for the two of us within our family plan. We each have personal accounts for to play in our cars or outside the house, and we share a joint home account. You can always switch accounts to access a playlist you saved elsewhere. You also can “follow” each other and share music easily that way. The setup process is similar for all streaming services. You go to their website, click “sign up,” and create a user ID and password. You enter payment information and usually are asked to select your favorite music genres. Based on this information, the algorithm will start suggesting songs you might want to hear. Each streaming service has tutorials on how to use their web-based application or desktop/mobile apps. But you can start playing music without a lot of training. There’s always a search box. You can save songs or albums, create playlists and even “follow” public playlists curated by the company or another listener. So pick a service (maybe one that’s new to you) and give it a try. You’re not going to break it, and you’ll probably have some fun. Can you stream audio on bigger speakers? Once you get the hang of streaming music on your computer speakers, or of listening to it on your phone with earbuds, it’s time to level up. Most streaming services work well with smart home speakers like Amazon Echo or Google Home. This post tells you more about why you might want to buy a smart speaker – it does much more than just play music. There are plenty of options for external speakers you can connect via USB or Bluetooth in order to play streamed music. You definitely aren’t limited to listening only on your phone. What can you stream besides music? While streaming services tend to focus on music, they also help you discover new audio content. Podcasts, for example, are becoming increasingly available on Spotify and other streaming services. In addition to podcasts, you can stream audio content from concerts as they’re made available by artists. Spotify has video shows that usually feature certain artists or genres. They sometimes offer Spotify-exclusive content as well. You can subscribe to MLB.com, but you also can stream games from your favorite team for free: check the website of the radio station that broadcasts their games. Go Giants! This summer I hope to attend a performance at the incredible outdoor Santa Fe Opera. Truth be told, I’m not much of an opera fan. But I’ll be able to familiarize myself with the music ahead of time by listening to it on Spotify. That’s how I prepared to see Hamilton,* and it greatly increased my enjoyment of the show. So don’t limit yourself to the same old albums and playlists. Mix it up. At a minimum, sign up for a free trial with one of the streaming services and see what you think. Sometimes the people who arrive late to the party are the ones who end up having the best time.